When William J. Kerr, our popular jeweler, cut out a little tin man which he made do funny stunts on an ordinary horseshoe magnet and told his friends that he was going to get it patented and make a fortune on it his friends thought that he was extremely visionary. This happened only a little over a year ago, but it already looks as though his dreams were soon to be realized. 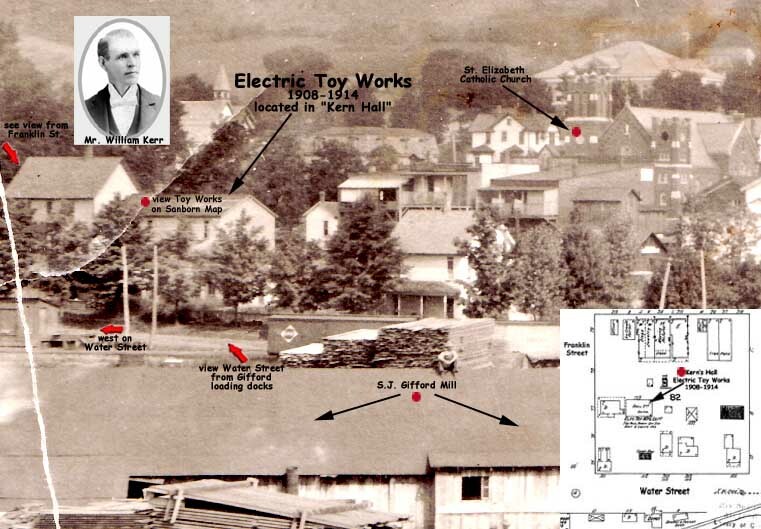 He got the patent and then had a few gross manufactured at the Smethport Electrical Toy works. These he sent around to various toy dealers and he soon commenced receiving orders for the toys in small quantities and steadily the orders have been increasing. One day last week two jobbers, who have handled a few of the toys, came here and are negotiating to handle the whole output of the factory. At the present time the output is comparatively small but if these gentlemen take the selling agency they want him to equip a large factory and be in position to manufacture one hundred gross a day. The matter is now under consideration by Mr. Kerr and the stockholders in the factory and they expect to come to a decision to-day. If this deal is closed it will take a force of at least seventy-five persons to manufacture this amount of goods, and as they will be made in Smethport it means a good deal to the future of this place. Of course a good share of the labor can be performed by boys and girls but some skilled help will be necessary. 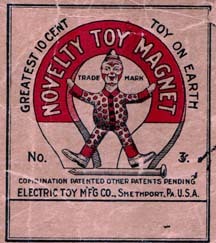 Whether a deal is closed with these gentlemen who are after the selling agency or not, it is certain that this toy is popular with the children and there will be a great demand for them as soon as they are properly introduced before the public, and this means business for Smethport in the manufacturing of them. The toy is in the shape of a little man, with his arms wide apart and high over his head and his legs spread well apart. He is clothed in a highly colored suit of tight fitting clothes, designed especially for acrobatic stunts and when he starts performing on the horseshoe magnet he is highly amusing to both young and old. Some of them are on sale by our local merchants and if you have not seen one go and make a purchase for the youngster. Could Kerr possibly be linked to E. B. Cuttel? At about 6:45 o'clock this morning the fire department was called out by a blaze at W. J. Kerr's toy factory, which is located in the C. M. Colegrove building just East of South Franklin street, between Main and Water streets. When the fire was first discovered dense volumes of smoke were pouring out of every part of the building, and the onlookers were of the opinion that the entire building was gloomed to destruction, as well as Mrs. M. B. Greer's residence on the West, which is only separated from the factory by a few feet of space. The three chemical engines were first on the ground, and did splendid work, and again demonstrated that Smethport never made a better investment that it did when it purchased these engines. The chemicals practically had the fire under control before the hose was laid between the burning building and a hydrant on Main Street. The steamer "Henry Hamlin" was stationed at the foot of Union Street, and hose laid to the burning building, but happily the services of the steamer were not needed. The fire is supposed to have originated from the bake oven used for the purpose of baking the enamel on the toys, in which a fire had been left last night. Fortunately Mr. Kerr's loss is light. While considerable stock was damaged by fire and water, the machinery of the plant, strange to relate, was uninjured, and is all ready to be put in operation at once, all of which is exceedingly fortunate. The building was badly charred on the inside, and we were unable to learn whether or not Mr. Colegrove carried any insurance on name. 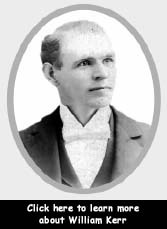 William Sidikina, an employee of the plant, was the first to discover the fire. As he went to work this morning, and on opening the door, he was greeted by a sheet of flame. All in all it was a lucky escape from a most destructive conflagration. E. B. Cuttel is in town endeavoring to interest local business men in the manufacture of several electrical devices of which he is the inventor. He gave a demonstration of the workings of the articles, which are really toys designed for the amusement and instruction of boys and girls, at the Wright House one night this week, and the devices certainly look like novelties that will catch the public fancy. Several well known business men of Smethport, have interested themselves in the matter enough to hear Mr. Cuttel's proposals and figure upon the cost of manufacturing the toys. It is understood that some of them are of the opinion that it would be a favorable investment, as there are establishments in town where the articles could be made at a very reasonable cost. One of the toys that is especially interesting is a small electric motor of surprising strength, capable of running enough machinery to delight the most exacting small boy, as well as giving him a very fair initiation into the mysteries of electricity. Mr. Cuttel is a pleasant gentleman, who met with a most distressing adventure three years ago. While walking across unfamiliar country one night, near Camden, N. J., he lost his way in a storm and wandered about for hours until he became unconscious. When found the next morning his arms and legs were badly frozen, and the terrible experience cost him the loss of all his fingers and the toes from his left foot. However, in spite of this handicap he performs various kinds of work with his hands, almost as well as a person with the full allotment of fingers. His intentions are to make a thorough effort to manufacture his toys in Smethport and place them on the market, and it is certainly in the range of possibilities that his efforts will be successful.